Whisky brand Auchentoshan has worked with agency to White Label to create a brand experience at Craft Beer Rising, which takes place in London from 23-25 February. 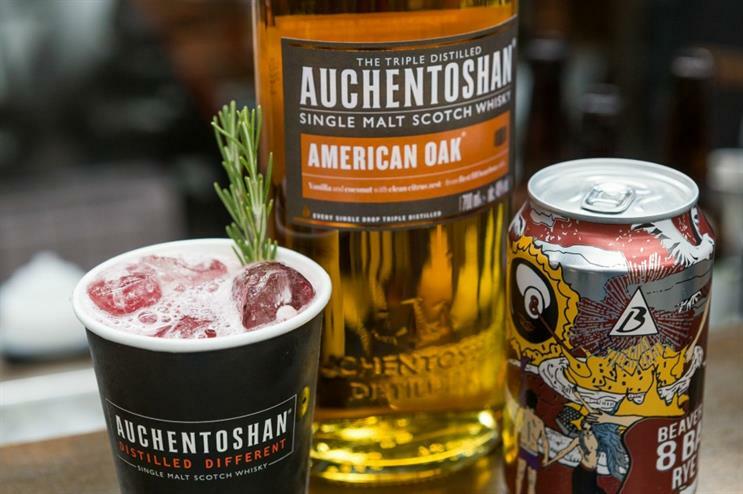 Auchentoshan will be offering consumers the opportunity to create their own Auchentoshan & Ale drink in a branded beer can on the spot, using a crowler machine. Visitors to the Auchentosham area will be able to select a base liquid from a menu, 35ml Auchentoshan American Oak, mixed with different combinations of jams, bitters and syrups. The ingredients will then be mixed together, and topped up with the consumer's beer of choice. The mix will then be canned using the crowler machine. The activation forms part of the brand's mission to revolutionise the way people drink whisky and to prove that it is not for a place beyond wingback chairs, after-dinner digestifs and golf clubs. The aim is to literally put the power in consumers’ hands, allowing them to drink Auchentoshan & Ale in a way they can call their own. Auchentoshan will also be providing whisky tastings and beer pairings at Craft Beer Rising, alongside workshops about the relationship between whisky and beer. Auchentoshan's crowler machine will also visit London Beer Week, London Cocktail Week and various street food events throughout the year. Craft Beer Rising will take place from 23-25 February at Old Truman Brewery, Brick Lane in London. In 2014, Auchentoshan hosted a party in an abandoned tube station in Shoreditch to launch its American Oak offering. Blog: The top takeaways from London Cocktail Week looks at the big trends and experiential efforts of the major alcohol brands at last year's event.